As I was growing up my grandma, grandpa and I exchanged homemade gifts – from stuffed bears made by Grandma to custom tables built to my dream measurements by Grandpa, it became our little tradition. As I got older that special gift-giving kind of faded away, but in the last few years I’ve begun making things for my grandma again. Even though Grandma used to sew often, making quilts, stuffed animals and pillows, her eyesight has gotten to the point where she’s unable to do all that she used to. At Thanksgiving she gave me her sewing cabinet, which used to be my great grandmother’s. The cabinet isn’t necessarily an antique — it’s a simple cabinet purchased in the 80s to hold Great Grandma’s notions. It’s what the cabinet contains that warms me everywhere. 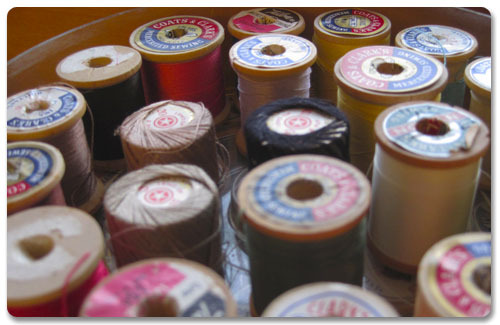 Nearly 200 spools of thread — all colors and weights — fill the top few drawers. Proof that Great Grandma lived through the Great Depression is evident in the spool that holds the last foot or two of dozens of different threads, waiting to be used completely. Patterns for doll clothes and old sundresses for my aunts when they were young are mixed with patterns for 80s style suits and felted ornament instructions. Grandma and Great Grandma’s handwriting pops up in the margins of instruction booklets and on scraps of paper strewn throughout each drawer. I’ve read all the notes the two of them made about how to get an inseam just right and how to make Skipper’s clothing perfect. Then there are wooden spools, which stopped being produced sometime in the 1980s. 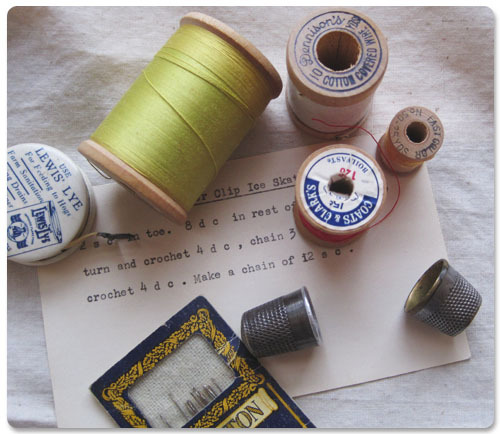 There are the packs of Clinton De Luxe Needles made in England of Sheffield Steel, complimentary gift needle assortments from vendors like Orr’s Pharmacy and a Lewis Lye advertisement celluloid tape measure. There are patterns typed on index cards. There’s a history of not only my family, but also a bit of American history in these drawers. Looking at these objects I dream of living in another time. I want to receive complimentary packs of needles at stores instead of magnets advertising websites. I wish for well-made notions made for saving and keeping for generations instead of disposing when they inevitably fall apart. I aspire to do more with my hands. What a treasure. I heart your grandma/great-grandma. So cool! I too wish I could live in another time. So many different times, actually! 1940s, 1890s, 1770s… shall I go on? I hope Grandma checks out your blog. This entry will make her feel good … just as it does me. I am glad that you have been appointed keeper of the chest and that someday, in the very distant future, there will be a family member gifted with it who will appreciate all of the items that YOU have contributed. Maybe Alex will produce a crafty little neice or nephew ……. yes, sometimes life is weird.